Image caption A police official said since the bride was already married now, what could anyone do? 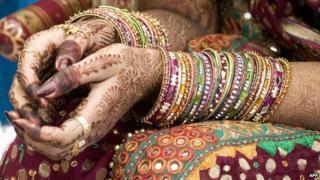 An Indian bride has married a guest at her wedding after her groom-to-be had a seizure and collapsed. Reports said the groom, Jugal Kishore, was epileptic and he had kept the information from the bride, Indira, and her family. While Mr Kishore was taken to hospital, the angry bride decided to switch husbands. She asked a member of her brother-in-law's family, who was a guest, to step in and marry her instead. He agreed. The incident took place in Rampur town in the northern Indian state of Uttar Pradesh. According to a report in The Times of India, Mr Kishore, 25, fell to the ground in front of the wedding guests just as he was reaching out to garland Indira. On his return from the hospital, Mr Kishore pleaded with Indira to change her mind, telling her that he would be ridiculed by friends and relatives if he went home without a bride, but she refused. Local police official Ram Khiladi Solanki told the BBC that Mr Kishore and his family were initially upset and lodged a complaint with the police. "But since the bride is already married now, what can anyone do? So the families have resolved the matter and the complaint has been withdrawn," he added.